For nearly four decades I’ve lived literally on the campus of DePaul University and every day hundreds of students walk past my house. From my bedroom window, I can look across the street into their classrooms (I imagine that the students looking back see an aging man in pajamas). Except for the fact that I wear earplugs when I go to bed because college students have the same sleeping hours as vampires, they’re nice kids. One day a few weeks ago when the weather was nice, I was sitting outside on my stoop watching the gaggle walk by and noticed something troubling. Unsurprisingly, most of the students were staring into their phones, using some sort of preternatural radar to prevent collisions. What shocked me was the number of double chins. I got up and took a short stroll around campus. Yes, it was startling. The smartphones of these 18-to-25-year-olds had created double and sometimes even triple chins. All doctors, myself included, dream of discovering some new syndrome or illness and reporting it to their colleagues in the medical journals. I was all set to write an original description of the “smartphone chin” until a few minutes of research into the plastic surgery journals revealed this had been a topic among cosmetic surgeons for some time. 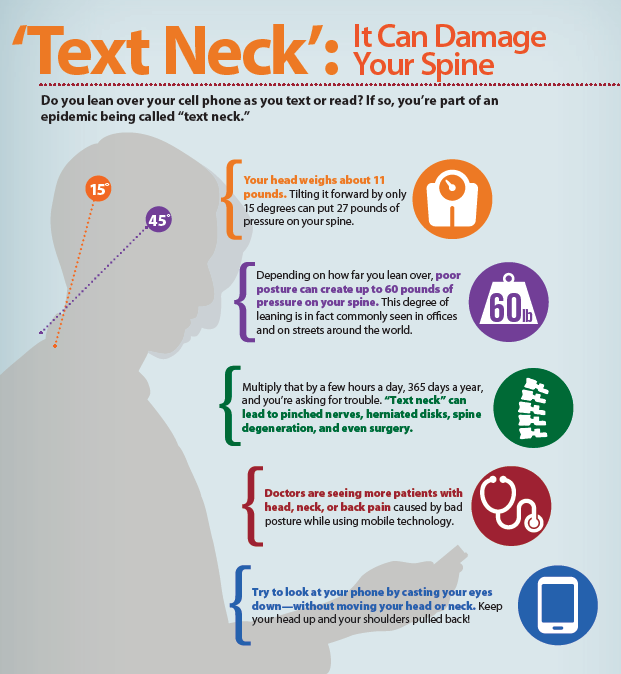 The closely related text-neck has been well recognized by both orthopedic surgeons and chiropractors for years. Think about it. Your head weighs approximately ten pounds. As you tilt your head forward, this weight increasingly pulls on the muscles in the back of your neck. You can feel this yourself if you slowly lower your chin to your chest while keeping one hand on the back of your neck. Increasing the angle of tilt increases the tension. If you hear (or feel) a crunching sensation, that’s arthritis. In addition, a downward angling of your neck can permanently damage the cervical (neck region) discs of your spine, leading to early arthritis and a risk of painful pinched nerves. Take a look at this drawing depicting the 27 to 60 pounds of pressure staring at a phone can place on your spine. Those DePaul student chins had caught my attention and it hadn’t been my imagination at all. In fact a new survey by the American Society of Plastic Surgeons (ASPS) revealed that chin implants, or “chinplants,” are the fastest growing cosmetic surgery trend. The reasons for this? First, more double chins. Second, increasing self-awareness of double chins and sagging jawlines as seen in selfie screen reflections. Other causes include a naturally short, weak chin, weight fluctuations, and even exercise and diet. My gut feeling is that no parent forking over some $40K a year in college tuition is going to take seriously her student’s plea for cosmetic surgery, but for those of you now fearful of seeing yourselves on Skype, here’s some of what’s currently being offered. With “chinjections,” the surgeon numbs an area of your sagging chin and resculpts your chin by injecting a filler (Restylane SubQ or Juvaderm Voluma) deep under the muscle to tighten it. The results are instantaneous, but need to be repeated every two to three years. For jawline skin sag, there’s a new generation of skin-tightening procedures created to avoid actual surgery. These include radiofrequency treatments in which heat passes into the sagging subcutaneous tissue through hair-thin needles. Pesky double and triple chins can literally be whisked away by liposuction, but you’ll need to stay home for a couple days wearing a compression bandage around your head. If you don’t want cutting or needles, there’s ultrasound. And, of course, you can always go whole-hog and get a facelift. Traditional Chinese medicine practitioner Mari Stecker has been doing facial rejuvenation therapies for years on dozens of satisfied patients. She offers classes in guasha, a Chinese facial technique. Generally patients prefer her price ($65 per class) to those of the average cosmetic surgeon ($5,000 for radiofrequency treatments, same for facial liposuction). Chiropractic physicians Cliff Maurer, DC, and Paul Rubin, DC, can certainly help your text-neck pain and start you on some exercises and nutritionals to prevent disc degeneration and early-onset arthritis. Some of these gentle and often non-manipulative techniques build muscle memory over time to help you maintain good postural habits. Occupational therapist Valerie McConville, OT, is a valuable member of this team. Between your chin(s) and your neck issues, your body is simply telling you that you’re doing something with your various screens (PC, tablet, phone) that’s all wrong. Valerie will recreate each of these situations and show you how to get them right. Yoga Therapy can also be a helpful tool to reduce the impact of postural strain created by everyday tech use. Renee Zambo, RYT, creates gentle yoga sequences that help improve posture and breathing habits. Learning mindfulness techniques may even diminish constant phone, email and social media checking altogether. In the meantime, here are some immediate steps you can take. I doubt if any of this advice will help the DePaul students. Remember when you were that age? You thought you’d be 21 forever. Thanks for this. I currently suffer from Cervical Radiculopathy as well as Fibromyalgia. Together we’re talking pain on pain… Yoga definitely helps and is a requirement in my daily routine. Most days the only thing that gets me moving is a morning yoga session and a hot shower. BUT this TEXT CHIN issue, I’m seeing in grade school children and high school students. I’ve heard so many late teens ans early 20 somethings talk about how old they feel. Every time I hear this, It troubles me. Your article makes complete sense. Smart phones and our addictions to all things mobile electronic and the Internet, are aging our youth literally from the inside out in starting in their teens! That is worrisome! Consider what type of physical illnesses our next generation will be faced with from early onset deterioration. What can be done to get kids to accept these truths early on, in an effort to reverse long term physical damage? Definitely need some type of campaign to remind and urge our youth. Have you heard about “scalp acupuncture” and Jason and Linda Hao? They are in Santa Fe NM – we are learning about it from our niece who is credentialed in many different alternative/Chinese medicine/acupuncture treatment modalities and is a reliable resource…..I’d be interested in your views or that of your acupuncturists on staff. Dr. E, thank you for your essay but even your humorous edgy writing couldn’t keep me from deep sadness about this world of self-scrutiny on social media. Also, the prediction that the youth of today will be in their 60’s and have all kinds of new body mechanics issues because of tech use. I mean, in a way we are front loading future PTs and doctors lots of patients but that kind of job security, I can live without.